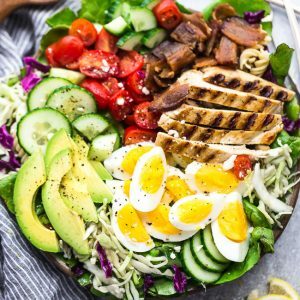 Chicken Cobb Salad has all the classic flavors of the popular favorite with a simple vinaigrette. Made with lettuce, tomatoes, bacon, cucumber, avocado and cheese – perfect for a healthy lunch, dinner or your next summer potluck! Best of all, low carb, keto friendly with paleo and Whole 30 options. When it comes to lunch, healthy loaded salads are my favorite. They are a great way to use up any extra vegetables and protein you have in your fridge. Cobb Salad is a classic favorite and one of the salads I usually order when we’re out at a restaurant. They are usually a pretty safe low carb and keto-friendly option depending on what dressing you pair them with. Creamy ranch, Caesar, Poppyseed or even Balsamic would be some other great options. 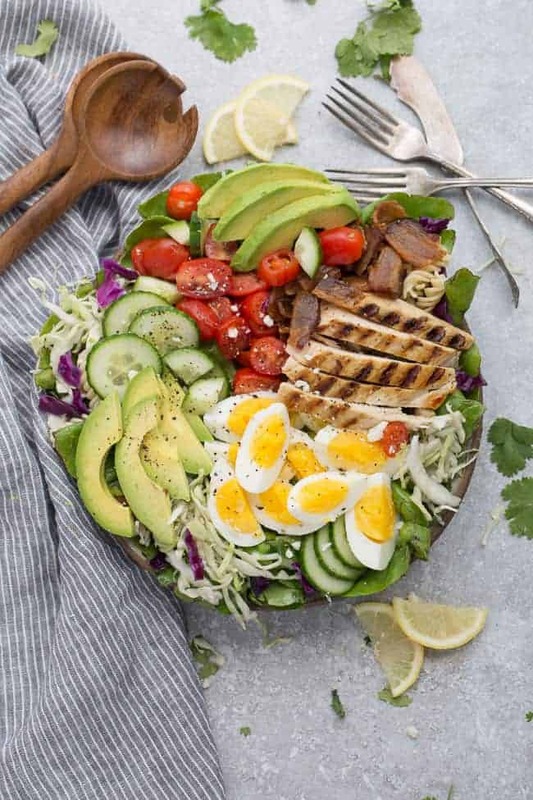 This Chicken Cobb Salad is made with mixed greens, grilled chicken, Canadian bacon, hard boiled eggs, cherry tomatoes, cucumbers and avocado. The best part? 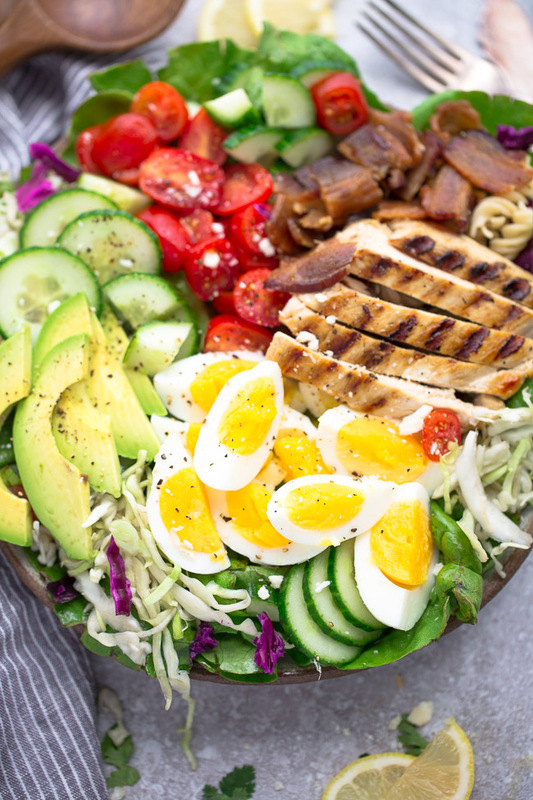 You won’t have to leave your house since this grilled chicken cobb salad comes together in no time. All you need is about 30 minutes (or less) to have this delicious salad on your dinner table. Feel free to add your favorite toppings like chopped nuts and crumbled cheeses. 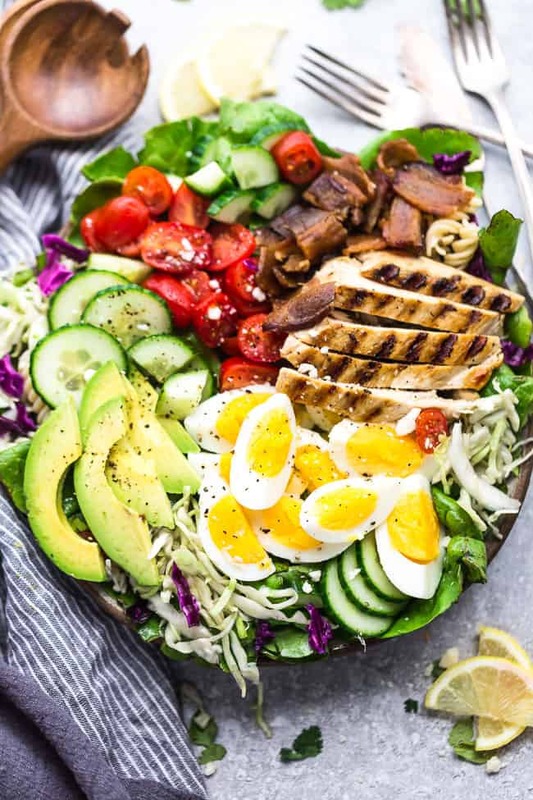 Or leave out the cheese to keep this yummy cobb salad paleo and whole 30 compliant. Cook and crumble the bacon then grill the chicken. You can also swap in leftover cooked, roasted or rotisserie chicken for easier prep. Add any other toppings you like then drizzle with the simple vinaigrette right before serving. Marinate the chicken the night before and store in the fridge in an airtight container or zip-top bag. 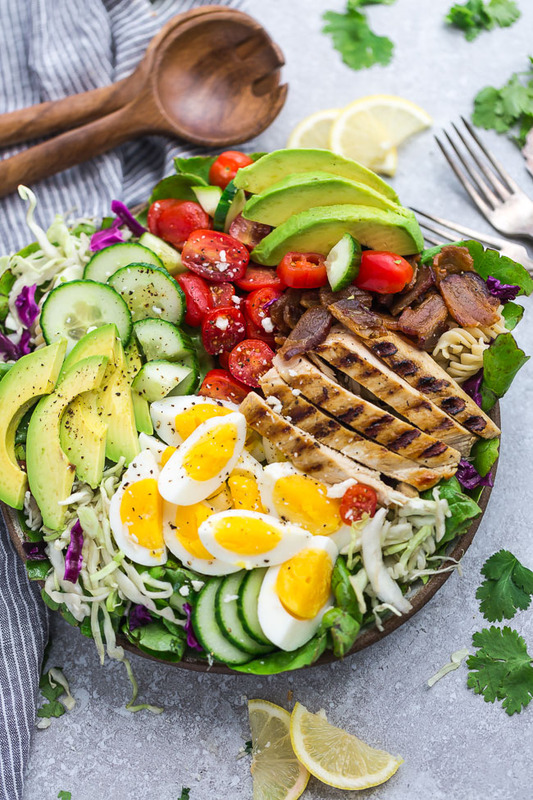 Chicken Cobb Salad has all the classic flavors of the popular favorite with a simple vinaigrette. Made with lettuce, tomatoes, bacon, cucumber, avocado, and cheese – perfect for potlucks! In a resealable zip-top bag, add chicken, salt, pepper, and garlic powder and marinate for at least 30 minutes. Drizzle with fresh lemon and olive oil. In a large bowl, add the lettuce, then top with cooked chicken, eggs, avocado, bacon, tomatoes, cucumber, and cheese. Drizzle with dressing right before serving.